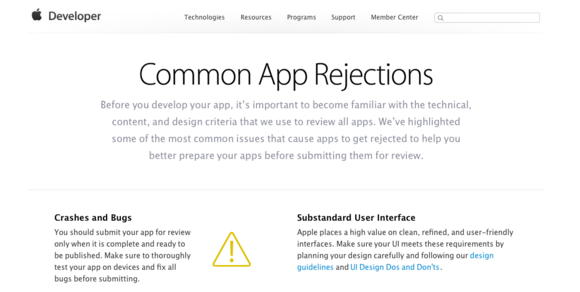 App Store rejections may not be the hot-button issue it was a few years ago, but for developers, it’s still a chief area of concern. To give app makers a little clarity and direction, Apple published a new page to its Developer site that outlines some of the most common reasons an app gets rejected from the App Store. According to the new page, which AppFigures linked to on Twitter, the most common reasons for rejection include issues with crashes and bugs, dead in-app links, and placeholder content that hasn’t been removed. Apple will also reject apps because of low-quality user interfaces, and apps that don’t match their description are also non-starters. In addition, apps should offer some “lasting value,” according to Apple. Apps that are nothing more than a wrapper for a website or have little to offer users may also be rejected. The new page also lists the ten most common reasons for rejection over a seven-day period, which should give prospective developers a clearer idea of what to do—and not to do. According to the page, the top ten reasons for rejection accounted for 58 percent of app rejections between August 21 and 28; all over rationale accounted for the over 42 percent.